Jay Jennings was mentored by Daws Butler, who felt Jay had the talent to do many of the classic Hanna-Barbera voices “spot on.” A meeting with Hanna-Barbera executives in Studio City was arranged so Daws could vouch for Jay’s talent, but before the meeting could take place Daws passed away and none of what he had hoped for Jay transpired. Unfortunately, Jay doesn’t have any photographs of himself with Daws, because they always went straight to work at Daws’ home studio in his garage and never posed for one. Jay Jennings’ speaking voice has been compared to a young Orson Welles, so to say he has been blessed vocally would be an understatement. Jay’s voice-over jobs have mostly been indie work: college radio station IDs, commercials, public service announcements, narrations, some horror movie trailers, and of course, his cartoon voices. Jay is also a celebrity impressionist and has been fortunate enough throughout his career to be have been trained by two legendary entertainers: Frank Gorshin (The Riddler on the ’60s cult classic, Batman) and Steve Allen. Jay Jennings is now a film director and L.A. historian, and still does voiceovers. He is also known as “The Knott’s Guy” having written two books about Southern California’s oldest theme park, Knott’s Berry Farm. DM: How old were you when you developed an interest in doing voices? JJ: My love for doing voices probably started when I was very young. I instantly felt a connection to all the cartoons I watched on Saturday mornings such as Yogi Bear, Snagglepuss, Bullwinkle, Daffy Duck, and Tom Slick, to name but a few. I always tried to impersonate them during the week and at school. I also loved TV variety shows of the early 1970’s where voices and impressions were on display, such as The Jonathan Winters Show, The Red Skelton Show, and The Kopykats. Interestingly enough, one of the first record albums I ever listened to was Rich Little’s Broadway, where I first learned to impersonate the likes of Alfred Hitchcock, John Wayne, Jimmy Stewart, and President Nixon. As I got older and my voice matured, I was able to mimic voices and mannerisms by watching a lot of old movies on TV and listening to impressionists like Rich Little, Frank Gorshin, Will Jordan, Fred Travalena, and George Kirby. DM: How did you meet Daws Butler? JJ: My mother, who once worked for the head of the William Morris Agency, was always on the look-out for agents and mentors to help me hone my acting and voice talent. She called in a few favors and arranged an initial meeting with Daws Butler at his studio in 1982. In fact, he was the first person to tell me that my speaking voice sounded very much like a young Orson Welles (on the radio). During that first meeting, I was in complete awe knowing I was in the presence of the man whose cartoon voices I grew up with. He asked me if I did anything special with my voice. I replied, “Matter of fact, I can do most of your voices.” He replied, “Oh really? Well, let’s see what you can do.” With that, I rattled off my versions of Yogi Bear, Snagglepuss, Hokey Wolf, Super Snooper, Mr. Jinx, and a few others. Daws grinned and said, “You know something, Jay? You have a great ear. I’d like to train you to make them even better.” So over the next five years, I was mentored by Daws to carry on his cartoon voice legacy after he retired. I’d say we had about twenty sessions in his studio. It was definitely magical. 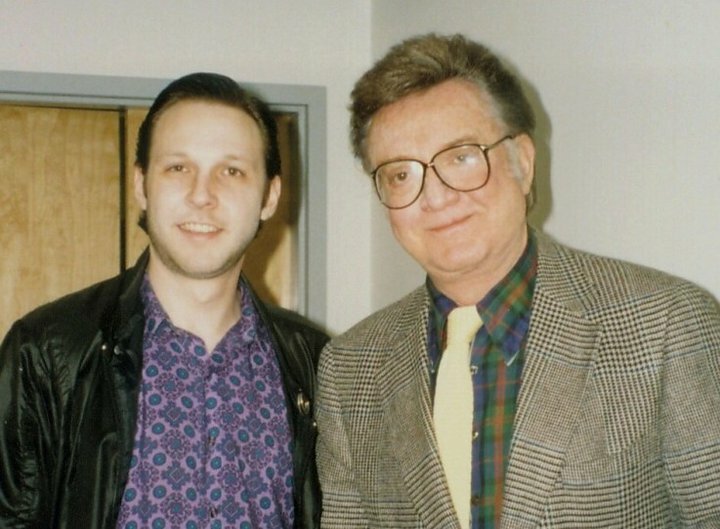 In 1987, while Daws and I were preparing for an upcoming meeting at Hanna-Barbera headquarters in Studio City, California, Daws’ health took a turn for the worse and he passed away less than a year later, so we never got to meet with Hanna-Barbera’s head of voice talent. I then turned my sights mostly to filmmaking, as my voicework kind of took a backseat over the next 20 years. DM: Were your sessions with Daws one-on-one or were other students of his (such as Nancy Cartwright) present? JJ: My sessions with Daws were all one-on-one, which Daws decided after our first meeting. He was very impressed with the fact that I could do a lot of his cartoon voices before ever being trained by him, so his goal was to help me perfect them and to excel in reading cartoon and commercial “copy” for auditions and future voice jobs. DM: Was Daws a fun person to be with? Considering his profession one might expect him to be a bit of an imp with a silly sense of humor, or did you find him to be more serious individual? Are there any anecdotes of your times with him that might illustrate? JJ: Daws, to me, was like a gentle grandfather figure, whose laugh was very childlike and innocent. He was serious when you were trying to read copy or learn something new and we would repeat it over and over until I got it right. “He would say, “No, try that again with more enthusiasm. Good, now try it again while breathing out slowly.” Daws knew every technique in the book when it came to teaching acting, voices, and breathing properly while recording in the studio, which by the way, was my favorite part of our sessions, going into the recording booth and making magic with our voices. By far, the most memorable session that we had in his studio was the time Daws suggested that we both take turns performing all the classic Hanna-Barbera voices as if we were at a big Hollywood party, commenting on the food and scenery. In essence, I would imitate Quickdraw McGraw, Lippy the Lion, and Snagglepuss, while Daws would answer back as Yogi Bear, Wally Gator, and Elroy Jetson. Unfortunately, I never asked Daws for a copy of this recording since I was too blown away at the time to realize the significance of this once-in-a-lifetime collaboration. DM: Could you describe some of the teaching techniques Daws Butler, Frank Gorshin, and Steve Allen used when you were being mentored? JJ: The main thing Daws pressed upon me during our sessions together, no matter what vocal technique we were working on, was to have correct pronunciation, cadence, and the right vocal audio level, not to mention, to have proper lip, mouth and teeth manipulation, which in turn, would make it easier to perform certain voices (i.e. an old man, a little boy, a British aristocrat, a gangster, or an Old West sheriff). 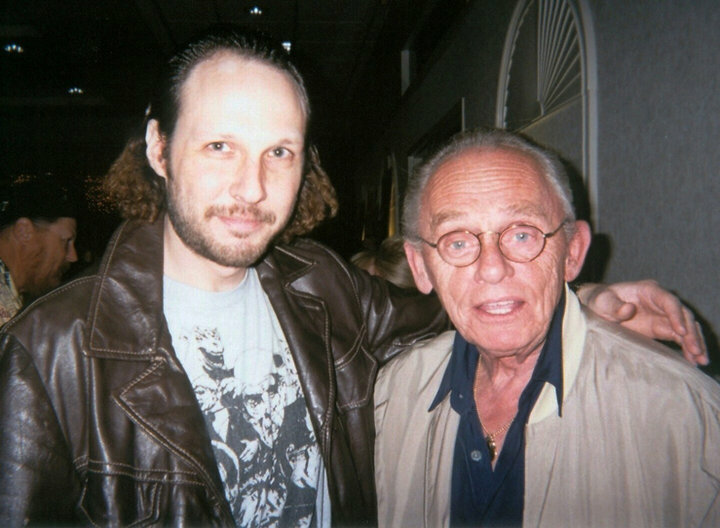 I met Frank Gorshin at an autograph show in Hollywood, California in the early 2000’s. He took a liking to me after I told him I was a big fan and a celebrity impressionist myself. During our half dozen meetings, Frank taught me the importance of facial expressions and contorting my face and lips when doing an impression. Frank was an extremely nice and cordial man. DM: Which celebrities do you like to impersonate? JJ: My favorite celebrities to impersonate are obviously the classic stars of yesteryear, such as Humphrey Bogart, Peter Lorre, W.C. Fields, Groucho Marx, Kirk Douglas, Burt Lancaster, Dean Martin, Vincent Price, George Burns, Jack Benny, Ed Sullivan, Charles Bronson, George C. Scott, Marlon Brando, Richard Burton, and countless others. DM: What physical preparation do you find helps your throat/tongue/vocal cords to duplicate voices best? For example, warm/cold liquids, lemon, honey, gargling, clearing your sinuses, etc. JJ: Before every voice session with Daws, he would offer me some hot chocolate to soothe my throat and voice and I’ve stuck with that vocal preparation ever since. If hot cocoa isn’t available, I find that hot tea with honey works very well. DM: Are you still interested in a career in voice-overs? JJ: I’ve been a film director since 1989 and it’s basically what I’m known for. I’ve made a name for myself in the amusement park genre by writing two books about Knott’s Berry Farm. With that said, it’s safe to say that I’ve never stopped working on my voice over endeavors, as I still perform the occasional narration, movie trailer, radio spot, and cartoon voice, always making myself available if called upon. Thank you for your time and use of your photographs, Jay. Voice Actors in the News wishes you much success in all that you do.